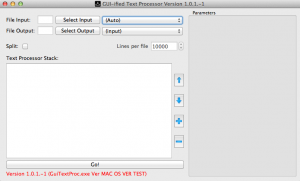 GUITextProc is a slightly crazy text processor I have been working on every so often for the last few months. 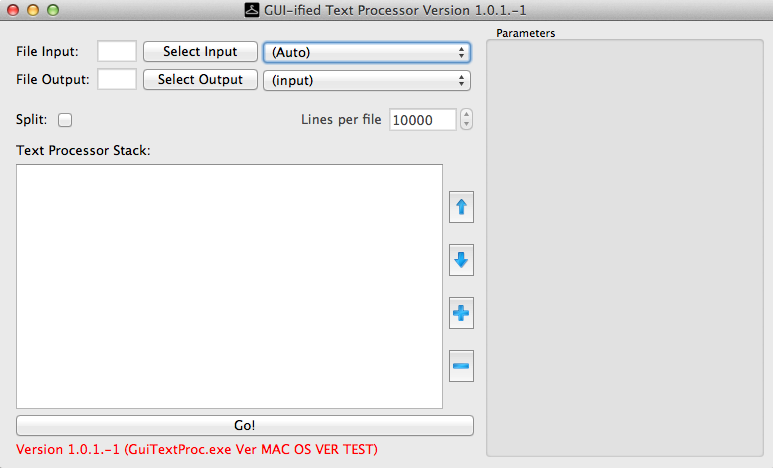 It is a plugin-capable text processor. You feed a text file in, and another, processed file is saved out. The original reason for writing it was that most text editors load the whole file into memory, which when you work with files that are sometimes 300Mb or more is a problem. What if you could cut the file down, by only including the lines you are interested in? It can also split a large file into smaller files. e.g every 10000 lines it can create a new file. You mentioned it is plugin based, how does that help? 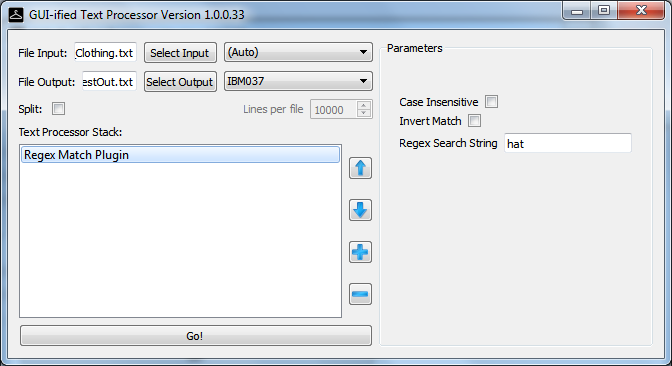 Right now there is one plugin: a regex matcher. Any lines that match (or, depending on configuration, don’t match) are included. You can chain plugins together, so for instance, if you wanted to include only lines that had the word “hat” in but not “scarf” you might first match all lines that do not have “scarf” in them, then match all those that have “hat” in. Can I make my own plugins? Right now, no, though I’m looking into releasing some sort of “plugin toolkit” for it. Also python extensions are a real possibility. Are there any other plugins? Right now, no. 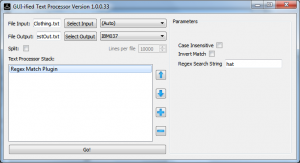 The regex plugin has been so useful that I have not needed any others. Does it do anything else fun? It’s fully unicode, so can deal with some pretty “interesting” text formats. It’s based on the Qt framework. Right now it will only run on Microsoft Windows because that’s what I use most of the time, however at some point a Linux port would be a possibility. No, the program itself is not open source, however some of the components are. It uses a stock build of libpcre (BSD licensed) and also the Qt Framework (LGPL licenced) – Under the terms of the LGPL license, I must supply the source code I used to anyone who asks. If you want it, give me a shout though to be honest you’re probably better off going to the Qt website and getting it yourself. Nothing! At least for now (and probably always) it is free. It’s only a small app, and I’m releasing it in the hope someone finds it useful. Why does it need network access? Yes! please do. I was originally going to put a no distribution clause in the license, but since I have the auto update checker ensuring everyone gets the latest version if they want it, I’m less concerned. The HotFix resoves an issue when multiple instances of the same plugin are loaded and the UI does not update correctly. Email crashes AT cullen-online.com if you have any problems, and I’ll do my best to help.